He delivered this emotional speech after no common ground was reached at his meeting with Treasury Minister Moshe Kahlon – who demands a spring election, and ahead of a news conference on Monday – at which Jewish Home leaders, Education Minister Naftali Bennett and Justice Minister Ayelet Shaked, threaten to resign if Bennett is not awarded defense. By stepping down from defense last week over the government’s approval of a ceasefire with Hamas, Avigdor Lieberman left the government with a fragile major of 61 in the 120-seat Knesset. He appealed to “the citizens of Israel” for understanding that it was not possible, in the interests of national security, to share with them all the information in the possession of the IDF heads, the Shin Bet ad himself. He also appealed strongly to his coalition partners to act responsibly and not bring down the government at this time. 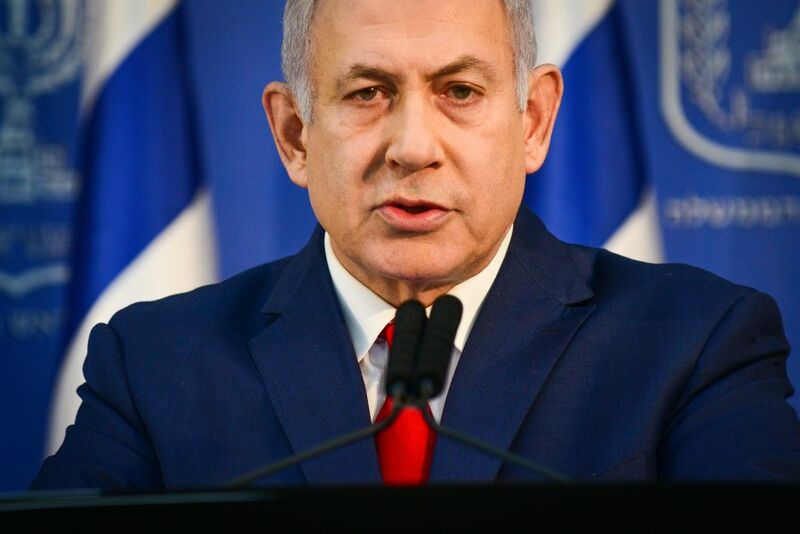 DEBKAfile: Netanyahu, having lost the backing of most of his coalition partners and damaged his popular credibility by his government’s handling of the Gaza crisis, tried going over the heads of the politicians to win over the ordinary citizen. He told them that his commitment to national security was long proven and absolute and the situation was too dire for political or personal calculations to weigh in. It is hard to believe, however, that after a long period of security restraint, he can garner enough popular support to overcome the political opposition piled up against him and avoid a snap election, unless the “security step” he mentioned comes to light in time. Must be something interesting no one wants to talk about that is coming down soon. As Lieberman grew deeply suspicious of own image and political profit he could squeeze out of Netanyahu’s governing, his answer to the strategical needs of the state was an act of despair. 1. Because of the failure to reserve his resignation for the French Peace Plan. The everyday Jew and Israel are dumbasses. They have no idea… I think bibi should open up Pandora’s box… And allow a major war to begin. And then we can watch all the Jews and Israelis take up arms. And lose the loved ones. And see how much they love war… Hitler was right about the Jew. They are the most stupid people on the planet. I actually completely agree with that. Bibi. Don’t worry. If they don’t appreciate your unseen efforts. Then… Let the other make a jackass out of the nation. Let them destroy there own nation. We that God is about to bring the mother of all holocausts soon. So why stop god’s righteous judgements? Let the show begin! such hate speech. must be a russian troll. too bad he’s not genius like you…….putz! You’re probably a warehouse stocker or a bus driver ,no? You should concern yourself with yourself. read in your bible how this showdown ends. God allowed Israel to regain their homeland and he didn’t allow it to punish them so choose words carefully. its what comes out that your judged by..either your God or their God or my God. God hasn’t reneged on his chosen people the “jews” you speak of are business men..outside to the confines of Jewish religious matters and totally opposite of the common folks who try to live as God intended. And revealed hath been the honor of haShem, And seen it have all flesh together, For the mouth of haShem hath spoken. Withered hath grass, faded the flower, But a word of our G-d riseth for ever. Yeshayah (Isaiah) 10:16-23 …the Lord, HaShem Almighty, will send a wasting disease upon his sturdy warriors; under his pomp a fire will be kindled like a blazing flame. The Light of Israel will become a fire, their Holy One a flame; in a single day it will burn and consume his thorns and his briers. The splendor of his forests and fertile fields it will completely destroy, as when a sick man wastes away. And the remaining trees of his forests will be so few that a child could write them down. In that day the remnant of Israel, the survivors of the house of Jacob, will no longer rely on him who struck them down but will truly rely on HaShem, the Holy One of Israel. A remnant will return, a remnant of Jacob will return to the Mighty God. Though your people, O Israel, be like the sand by the sea, only a remnant will return. Destruction has been decreed, overwhelming and righteous. The Lord, HaShem Almighty, will carry out the destruction decreed upon the whole land. Here you go again, iVaN, quoting grossly out of context and regurgitating it here. After typing such a long post, iVaN, can you feel the tapping on your shoulder…………..do you know what that is? It’s one of the other patients in your ward very impatiently waiting for his chance to get on that community computer so he can get onto Sponge Bob’s website. Take into consideration, iVaN, that what he wants to do on Sponge Bob is just as important as what you, iVaN, are doing here on Debka! Perhaps you should read Torah instead of satan-inspired talmud. YHWH has *NOT* brought His people home. “Those who call themselves jews, but are not, but are of the synagogue of satan” have hijacked the name of YHWH’s chosen, and through intrigue, subterfuge, and war OF THEIR OWN MAKING have sought to steal the land rather than wait on YHWH as He directed. The usurpers will be cast as chaff into the fires, while the true children of Abraham, Isaac, and Jacob remain in safety abroad, as diaspora, as commanded. Sad that so many in the world have chosen to follow the false prophets…ultimately to their own doom. Now that you’re finished with that comment, it’s OK to get back to that HAM sandwich and don’t forget to wash it down with that big glass of milk! There Is No GOD only Brainwashed Religious Cult Followers like you….Go and see your Brain Doctor and tell him you are Suffering with Delusional thoughts like most people with Mental Healthe Issues they end up in the NUT HOUSE or on Medication…..Hope you get Well Soon……Facts not Religious Cult Brainwashing Fiction. You must have been looking at yourself in a full length mirror when you gave yourself that name and your comments will certainly attest to that! BTW, walk over to your living room window: is it a nice day in Tehran today? Oh, is that why there are more than 6000 successful startups currently in Israel? So how do you account for the globally recognized and currently in service inventions and discoveries by Israeli scientists and researchers in Mathematics, Science, Robotics, Chemistry, Physics, Optics, Medicine, Economics, Biotechnology, Theoretical computer science, Computing, Computer hardware, Computer and mobile software, Defense, Agriculture and breeding, Energy, Consumer goods, appliances, Games, and Food and drink? Or are you ignorant of these facts and just another typical uneducated and hate-filled anti-Semite? Your using Hitler as a positive example shows just how godless you truly are. EVERYTIME WE DID WHAT LEADERS LIKE BIBI SAID, WE WON SHORT & LONG TERM…. YOUR BLA BLA IS IMMATURE & GROUNDLESS. WE NEED TO CRUSH OUR NEIGHBORS/ENEMYS. THEY ARE WEEK & NAKED. IT’S A WALK IN THE PARC FOR ISRAEL. NETANYAHU IS THE BEST WE EVER HAD. Ending international isolation is very easy, abide by the UN Resolutions, stop behaving like an Apartheid State, stop attacking foreign States directly or indirectly such as Israeli support of ISIS in Syria. This will also go quite a way to reverse the anti-Semitic backlash thats growing rapidly worldwide. haha the UN who is so anti Israel. the only apartheid is in the arab muslim states where no Jews are allowed. while Iran carries on attacking Israel thru Hamas Hezbollah and now all with Russian support. Are you referring to the UN resolutions which were all bought and paid for by the Arab League? So Benet and Liberman will abandon just before a war? They should have the same knowledge and information BiBi have. He is trying to get the ppl trust, he completely lost it. If there will be war he will go for grand coalition not go alone. I think the submarine 3000 case is way to strong, in the coalition ppl abandon and our enemies know BiBi can not act with those accusations. He should resign but instead he is trying to buy time. I Doubt it He is not trying to fool Israel.But his judgement is suspect. For so long He allowed Israel to suffer from Hamas. I think that he is being made a fool by fake moves of Hamas and friends. It’s being proved now that he was fooled by Russians. Why should he be right Re. Hamas? No need for the Prime Minister to do that……………..the enemies surrounding Israel will start the war on their own! ‘Après moi, le déluge not only on our Sacred and Secret North by Northeast Plans but on Israel itself!’ HINTS Netanyahu. Hint Hint. Hint. Once Indispensible Man Netanyahu’s Clean Break Drive on Iran is seen as so well and truly busted as it is, well then, the hustle is busted and Humpty Dumpty doesn’t ever back up on his Apartheid Wall. Netanyahu’s Clean Break Drive on Iran has been already busted decisively by Obama in 2012, Aleppo Victory by Russia/Syria-busted, Syrian Truce Busted, S300s crewed by Russia-busted, the Foreign Half of Muller’s ‘Kushner and Donald Jr’s Logan Act Charges’-stung and busted, Trump Impeachment-busted, Peace Process-busted, incoming Israeli AG Case 1000 2000 4000 indictments-busted. MSB abandonment-busted, Kahanist-Wahabi Nato-busted. Qatari Al Jazeera Sting-busted, ICC busted. The Netanyahu-ordered ‘Mossad Dirty Tricks exposed by Mueller INCLUDE rigging the 2016 American Election (Bear and Forest Rodham-Clinton}, Logan Act worthy conspiracy charges with Kushner over UN 2334, Obama’s Iran Deal team intelligence smear ops, Weinstein, collaboration with George Nader/UAE over Regime Change in Iran, running the Christian Evangelical Alt Right/Richard Spencer and worldwide Kahanist/Nationalist Movements. Tic tock………must be the empty sound inside skull. That sounds like something you could relate to “in your younger days”……………..which aptly explains the rest of your post. “Tic tock………must be the empty sound inside skull. In actuality, William Teller is just a typical bogus conspiracy theory troll whose post has nothing to do with reality. History and mankind right now see it. Nobody wants silly blind hubris and fake ‘synchronicity’ of fullscale conflict with Iran/worldwide ordered by Bibi and Bibi alone 5 minutes before he’s indicted by Israel and likely Mueller as well. Who would even lead it from Israel? Under the influence and on parole? I thought crooks are smarter! And where Sir do you think Trump is on this matter? Please remember that the US Midterm elections were not exactly in Trump’s favor as the House is now controlled by the Democrats. Add to this that it seems that there is a possibility that the Crown Prince Salmon (to whom Trump has demonstrated “loyalty” to) might have been involved in the murder of Jamal Khashooggi https://www.bbc.com/news/world-us-canada-46254571. “The only sacrifice made should be the sacrifice of Netanyahu’s narcissism” – Name ONE leader of any country who is not a ‘narcissist”? They ALL love themselves. “The Man who Lost Israel” – ??? It hasn’t even started yet – way too early for that. – No??? Well, if Israel is defeated or weakened, what happens next? Do you think these people stay content with victory over Israel?? NO they are coming for YOU as soon as they can – and who will stop them? “Sacrifice that, Mr Netanyahu” – You have sacrificed commonsense to reactionary, group think. Dont judge too hard. It could be a lot worse. The burden of responsibility is very heavy. Ironically, those that criticize those in power, behave the same way when they are saddled by enormous decisions. Bibi has done everything he can diplomatically to preserve the country as it is. Some disagree, and say he should have done more militarily – perhaps he should have. What it looks like now is very ominous, where he is stating he is preparing the country to go to real war. Maybe others might be better leaders? We will never know, they are untested. I will say, that given all Netanyahu’s faults, he is the best leader that the country has – and all things considered it could be could be a lot worse – someone like Olmert could be PM. While Mr. W. Teller (a Trump hater) is ranting in his Debka commentary, the IDF is practicing in the Negev taking down the S-300 batteries in Syria. Once IDF has mastered this task the S-300 protected Iranian mullahs may as well commit suicide while Assad and Putin are forced to kick them out of Syria. The former Kishinev bar bouncer Lieberman knows it and hopes to take over the premiership before the IDF is done. Not a kosher move when Jewish lives are in balance. Some years ago rabbi Meir Kahane asked American Jews uncomfortable questions in his well known book, and was immediately reviled by the left both in Israel and in the US. Mr. Teller is correct that Trump is an American Christian Kahanist: nationalist and populist. China brought up from rural poverty 400 mln industrial workers thus de-industrializing the developed countries. This is the real reason for the current wave of nationalism in Brazil, US, UK, Italy, Eastern Europe, Russia. Such nationalism is not Antisemitic. If the Jewish diaspora political leadership does not join it then it may become Antisemitic. If Israel loses its way and turns left instead of nationalistic the nationalist world leaders will let the UN and Muslims destroy Israel. Take heed Mr. W. Teller! oh well, summer schools in session I guess! don’t you even remember what happened when the IAF had to admit to the Israeli public that the s300s sent to Syria are a quote unquote ‘GAMECHANGER’ and even fully cover BG? Nope? It was a public scandal, don’t you remember? All the articles in all the papers? No? Like how long have you been at your work? Gong…. schools out for summer! bibi is reincarnation of king saul. he must do good now. to all the Russian trolls you guys are easy to spot. and easy to smell with that Slavic stink. you and putin can all drop dead. It’s a mistake to EVER trust Russia. Just as Stalins Russia did form 1939-1941. Russia has a history of stupid, selfish, self-destructive behaviour. Oh, no. I feel an Ariel Sharon’s Gaza type deal coming. Something so bad that BiBi is scared will be leaked before he can give it away to the Pali’s. Bibi inspired Trump and Bolsonaro. Did well earlier against Iran. But now he had a wide open Goal, to destroy Hamas by any means, with the support of the International Community. Should have received the unconditional surrender from the enemy. Just bomb Hamas and / or cut the electricity. The International Community is disappointed at Israel (Bibi) for not doing so. We want to end the 100 years war. Another Lot of False Promises and Delusional Speach by that WEAK Religious Zealot Sermon by High Priest Nut-anyahu. He should be in the Church as he Speaks a lot of False Lies and is nort Realistic and has put his people in a Deathly game of Kill or be Killed as he Appeases the Enemy that last Week got Innocent people Killed because of his LACK of Vision and his War Cabinet Division. MR WEAK Nut-anyahu is a BIG Liability to the Whole of Israel and the Jewish State itself..
More Facts not Nut-anyahu Fiction. Send Nut-anyahu to Prison Today as has LIED and Failed to Lead his Scared People to the Promised Land.? People have been Murdered under his Pathetic Weak Lack of Leadership while he embraces Hamas with Open Arms and $$$$15,000,000 For Blood Protection Money. This WEAK JERK ,Nut-anyahu has accomplished in putting the Whole of Israel in the Sights of Hizballah and Iran,Hamas +Many more to Target and Kill. Call him a Leader,,,WOW he is a WEAK Delusional Fool who is responsible for the recent Deaths of his Military Leader and other Civilians. The whole World is now Witnessing the GREAT PRETENDER giving a SERMON of LIES….Facts not Weakness or Fiction. Israel has to continue to remain strong within Israel in the face to changing dynamics of Worldwide Impacts. Iran has decided to wait out the Trump Presidency but has a feeble not well liked Ayatollah Ali Khamenei at the age 79 that will cause a Political-Religious change as well. Saudi Crown Prince Mohammed bin Salman is in a terrible situation no matter how anyone wants to look at it, ignore it, or accept it, there will always be lingering doubts. Perhaps Russian and America can resolve the Ukrainian Crimea fiasco and come together in developing new oil, gas, and coal worldwide along with Saudi Arabia and Israel innovations. Communists China is on the brink of going either way economically. EU has always is full of discontent on everything. As India has to make its calls. So, Israel is looking quite stable politically, but Hamas, Iran, Syria, and Hezbollah will read this as weakness. So be it, that will be another one of their lost opportunities for Reconciliation, Rebuilding, and Peace for their own Prosperity. Instead of choosing to continue create Weapons, rockets ICBMS, and Smuggle arms to cause more Chaos on the Middle East. Prime Minister Netanyahu’s is still playing a Cool Hand in face of those seeking to pull Triggers to cause Hot Conflicts. Sometimes when up against all the Bluffs of Blistering Threats and Puffs of smoke to masked their own Problems of their inability to do Nothing is Cool Hand with a Failure to Communicate. Israel can strike back when they choose and when they need to and when prepared to accomplish goals that will determine the outcome. When and Wayward Winds are a matter of opinion?